If you register after 6:00 am Friday March 15th, please PRINT your receipt and bring it to packet pickup. Because of the ice & snow on the Lake Country Trail, we are moving Shake Your Shamrocks from Oconomowoc to Menomonee Park. We know you will have lots of questions, so here is a list of PAQ – potentially asked questions. The race time is now 9:00 am. The race is NOT at the Lakeside. It is at Menomonee Park W220 N7884 Town Line Rd, Menomonee Falls, WI 53051. 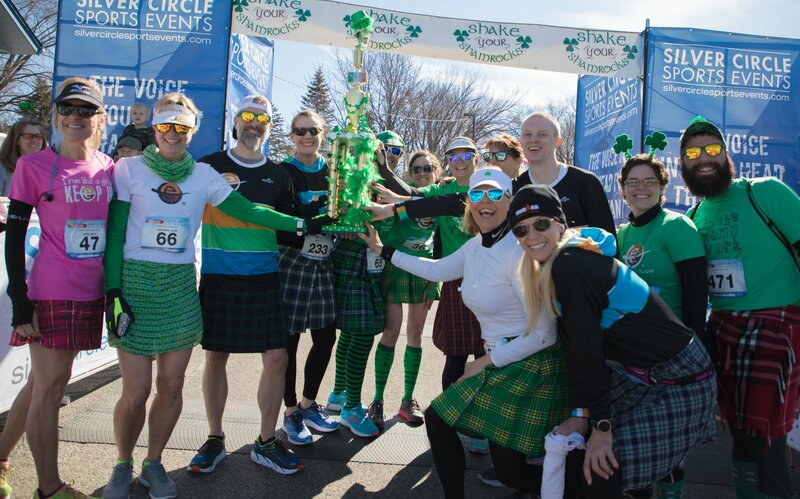 Shake Your Shamrocks is part of the Wisconsin Chilly Willy Run Series presented by Endurance House Delafield. Join Silver Circle Sports Events & The Lakeside for this 5K & 10K run / walk loaded with all kinds of participant goodies. Free beer, shots, music, and a chance for a keg party! Run or walk but shake your shamrocks. Make sure you come dressed in your best "Shake Your Shamrocks" costume. Largest team with a kilt - free round + obnoxiously decorated 2 foot team trophy. Best team (4 people+) costume - free after work keg party at The Lakeside! Congratulations to Team Endurance House Delafield on winning the Team Kilt Trophy last year. Run Shake Your Shamrocks with the best local running and training community in the area - Endurance House in Delafield. Overall Male & Female + top 3 male & female finishers in 5 year age groups will receive a custom medal. There is one aid station on the course. There is NOT a hot chocolate bar at this race because there is a free beer at the end! To redeem your free beer, take your bib to the BrewFinity table. Everyone who is registered by March 9 will be guaranteed a custom Shake Your Shamrocks shirt. After that, we cannot guarantee shirts and they will only be available while on line supplies last. Shirts are cotton unisex. If you stop in to get your packet don't forget your raffle ticket to win a free pair of shoes to be given away race morning! Must be present to pick up your ticket and shoes. Limit one ticket per person per packet (ie. no mass pickups). At packet pickup buy one get one 30% off of any shoe / apparel combination PLUS All remaining in-stock winter aparrel is 50% off. Parking is available at the Lakeside but it limited to 150 cars. Arrive early & car pool! Valley Road will be closed 15 minutes before the start and you will not be able to park after the road closure. There is NO parking on Valley Road, Silver Lake, Silver Circle, Silver Cedar or Silver whatever or any of the side streets (we have to run on them). Don't even think about it or your car will be towed and sent to a Russian gang. There is ample parking on Oconomowoc Parkway and we will run a bus to the restaurant. There is a $5.00 entrance fee that Silver Circle is covering. Just tell the attendant you're there for the race. You betcha eh. Cash, checks (Silver Circle Sports Events, LLC) and credit cards accepted.